- We discuss, rate, and share our memories of playing two (2) arcade games. - The two (2) arcade games have a common theme. The common theme could be something as simple as "games whose titles are compound words" (such as Zoo Keeper and Firefox) to the obscure as "games that Dauber first played at Hunk's Pancake House in Bradley, IL" (Frogger and Asteroids). 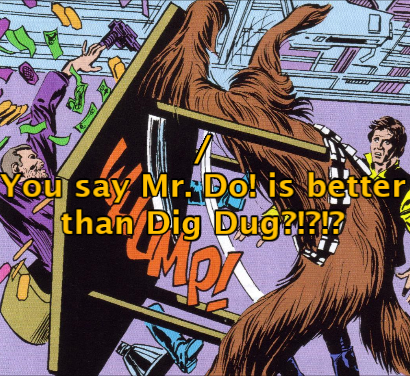 We've been doing the podcast since April of last year, and in the next few days we'll be releasing episode #44, in which we discuss Dig Dug and Pac-Mania. You can hear the podcast via the usual channels -- iTunes, Google Play, Stitcher...possibly a few other providers I'm forgetting about. We have a Faceobook page, and our web page is at www.piefactorypodcast.com. We welcome both audio and textual feedback, too! Oh...yeah...and we won the Golden Poddie Award for podcast of the year for 2015. Welcome to the forums dauber it's great to have you here! I've listened to the Pie Factory podcast before and thought it was fantabulous. I'm excited that you'll be posting your podcast in here, that's awesome. I'm glad we have another arcade collector in here because that's something we're really into and want to do more with in the site. Having Pie Factory around will be an awesome addition to the family! Thanks for the kind words, DeLorean. Full disclosure: not an arcade collector...at all. I'd rather just go to an arcade. (Where I live there's no paucity of them!) For many reasons, I don't think I'd ever want to have an arcade game. Don't have the room for one. And these things require semi-frequent repairs that I'm not really willing to do or have done myself; I'll just leave it to the experts. I DO have a Q*Bert marquee though, and I found the perfect place to hang it; just gotta figure out *how*. Thanks for the kind words, DeLorean. :)Full disclosure: not an arcade collector...at all. I'd rather just go to an arcade. So a new episode is out, effective, oh...ten minutes ago. In a very special Pie Factory Podcast, Sean and Jim speak openly and frankly about the games they both rated 5 Continues, with the help of longtime featherless biped Ferg. 'Swonderful. 'Smarvelous. 'Sthe final episode of 2016. What will 2017 have in store? The Pie Factory Podcast gang opens the first episode of 2017 with some tender-lovin' discussion of two of everybody's favorite arcade games. Or maybe not EVERYBODY's, I mean...whose favorite game is Mouse Trap? Maybe not yours, but...maybe someone's?? I don't know. Perhaps the episode will end with a huge honkin' explosion. Still a very new year, and the Pie Factory Podcast guys get yet another riproarin groundbreaking episode out. What are the odds? You'll have to listen and find out. Super Podcast Brothers' Andy Reierson joins Sean and Jim as they discuss two games that are such natural bedfellows that it's a disgrace that Pie Factory Podcast went on for 48 episodes before this pairing finally happened. Prepare to be Timinized! Just a quick update on the current state of Pie Factory Podcast. She looks so great. Every time I see her face she puts me in a state...state of Pie Factory Podcast. Sean and Jim are back from their three-week tour of Europe, Scandinavia, and the subcontinent to talk about a coupla games. You guard a van, and you hunt spies. There. Now you don't have to listen. Home? I have no home. Hunted. DESPISED. The jungle is my home. Where I can bust a move and listen to the mammoth blockbuster episode 50 of Pie Factory Podcast. Now, stop tampering in God's domain. I'll be the weird one and post feedback here this time! First, a brief back story: During the turn of the century, I worked a summer, youth work program run at an inner city church. The basement of the church was used as an area for the youth to hang out and contained four or five original arcade games, all set on free play, including a Pole Position, Donkey Kong and a Neo Geo cabinet with Bust a Move. The condition of the cabinets wasn't the greatest and the kids pretty much ignored them, but for me, it ended up being the first, and so far only times I played Donkey Kong or Pole Position in their original arcade format. Job perk! Back to the Neo Geo. I was able to open the cabinet and actually see the cartridge it runs on. In the last episode, I believe you mentioned that the cartridges for both the arcade machines and home system are the same, but they are not. Also, I don't believe they will work in both systems without an adapter of some sort. I for one wouldn't mind hearing about more Neo Geo titles as your show continues. 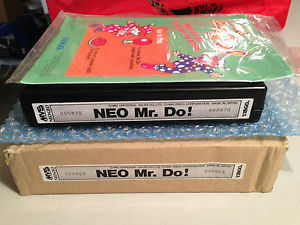 Yes there are a lot of fighting games, but it would be interesting to hear about the differences between the original Double Dragon and the Neo Geo Double Dragon. 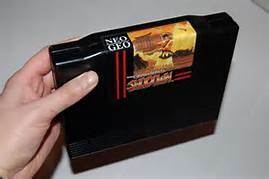 And there are some other Neo Geo non-fighting games that may make for an interesting show such as Bomber Man: Panic Bomber, Crossed Swords, Cyber Lip, Spinmaster, Super Dodgeball, The Super Spy, Viewpoint, Windjammers and the Metal Slug games. Arrghhgh...Phil, I'm a dunce....we forgot to address your feedback in episode 51....so....stay tuned for episode 52. Robocop & Smash TV, eh? Yes, Sean and Jim are back ALREADY with another new episode! Listen to the hosts discuss Las Vegas, record collecting...oh, and maybe an arcade game or two. Okay, okay, we get it: Sean needs to see more movies. But hey, listen to him discuss a classic dungeon game and a landmark racing game with Jimmy G, the man with a message. Or an awkward limp. We don't remember for sure. Feedback time for Gauntlet & Pole Positn'! I believe Gauntlet 4 on the Genesis was based on the original with some added enhancements, but was called 4 since it allowed 4 players to play at the same time, which was a uncommon for the system. 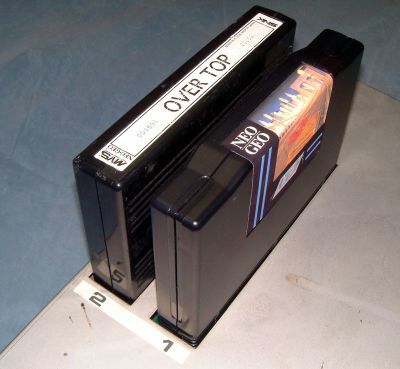 It was also one of the few games that worked with both Sega's four player adapter and EA's four player adapter. From what I hear, Pole Postin' on a real Intellivision is not that great, but I have yet to play it myself. I believe the Plug n Play you were talking about was the Ms. Pac-Man version, that didn't have Pac-Man on it. And it wasn't the joystick that turned, but rather the knob on top. But I must say that it is the best way I've found to play Pole Positn' at home. That knob works really well as a steering wheel. Finally, I agree with Sean agreeing with me that Ms. Pac-Man should've been the pack-in over Pole Position II for the 7800, but now I have proof. I recently read in an old 1996 issue of Electronic Gaming Monthly that Ms. Pac-Man was a top 20 hit in sales on the Sega Genesis and was popular enough to get a late release on the SNES. That just goes to show the strength of Ms. Pac-Man. And that was 10 years after the 7800 came out. It's not a knock against Pole Position II so much as it is a recognition of the mass appeal of Lady Pac. And THANK YOU for the site shoutout! Guess what...it's time for episode 56! That's right - episode 56, in which we talk about two Nintendo titles, is out! If we got any more specific, the theme would be too easy to guess! But we hope you enjoy this rollicking little kickoff to summer as your Pie Factory Podcast hosts are joined by a special guest to keep things a bit more under control.